Born on August 18, 1946 in Mahanoy City, Pennsylvania, Archbishop Joseph E. Kurtz earned bachelor (1968) and master of divinity (1972) degrees from St. Charles Borromeo Seminary in Philadelphia and a master’s degree in social work from the Marywood School of Social Work in Scranton, Pennsylvania, in 1976. Archbishop Kurtz was ordained a priest for the Diocese of Allentown on March 18, 1972. In November of 2017, the bishops of the United States elected Archbishop Kurtz as the chairman of the Committee for Religious Liberty, and in that capacity he serves on the administrative committee of the USCCB. 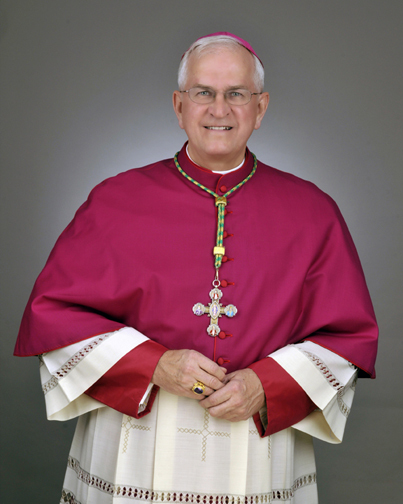 Archbishop Kurtz serves as the Episcopal Moderator for the National Catholic Partnership on Disability and Engaged Encounter and as the Board chair for the Catholic Education Partners. He is currently on the Board of Trustees of the Catholic University of America as well as the Board of Directors for the Institute for Priestly Formation and the National Catholic Bioethics Center. He also serves as a member of the Council for the National Catholic School of Social Service at Catholic University and on the Advisory Board to the Cause for Archbishop Fulton Sheen’s beatification. In February of 2014, Pope Francis appointed Archbishop Kurtz to the Holy See’s Congregation for the Oriental Churches. Archbishop Kurtz is the son of the (late) George and Stella (Zmijewski) Kurtz and the brother of (the late) Rosemarie Quinn, Patricia Cameli, Theresa Bakos, and (the late) George S. Kurtz. Established as the first inland diocese in the United States, the Archdiocese of Louisville was founded as the Diocese of Bardstown in 1808, transferred to Louisville in 1841, and elevated to Archdiocese in 1937. The Archdiocese covers 24 counties and hosts a Catholic population of more than 200,000 individuals.